This beautifully smooth enamel is studded with tiny rhinestones, adding sparkle to this classic equestrian bracelet. A customer favorite, this piece has been praised for its comfort and weight. One happy buyer even stated: "They are all either as nice or even nicer than the website represented them to be. 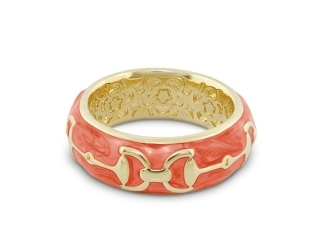 This enamel bracelet in particular is very, very pretty..."
Styling tip: What about a matching ring?